When you master using SONAR Home Studio 6, you'll know everything you need to use your PC as a complete music production studio. This exciting DVD shows you how to record live instruments and vocals, and mix them using SONAR Home Studio 6's studio-quality audio effects. You'll learn to edit audio, MIDI, and music notation and build backing tracks or entire songs while learning how to work with the hundreds of included instrument sounds and tempo-syncing loops that come with SONAR Home Studio 6! 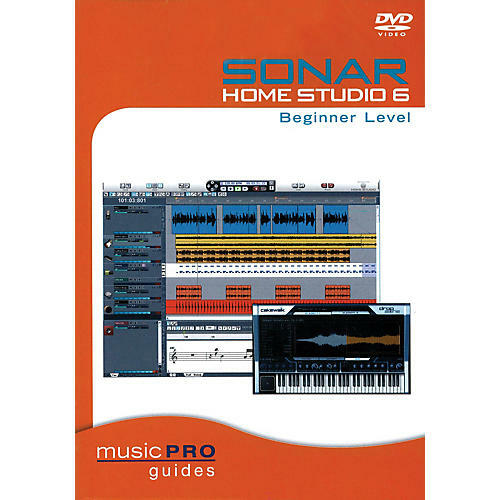 This DVD will help you gain expert-level knowledge on using SONAR Home Studio 6 to: navigate the Home Studio 6 interface; record any instrument; create music notation; quickly create backing tracks; use the new Synth Rack of VSTi and DXi instruments; edit; produce remixes and soundtracks; mix and share your music; and much more! 120 minutes.